Took my console out to put in new carpet and misplace the fastener that hold the clock in place. Who sells them ? NPD has some that look similar but it said there for a 1970 mustang. (04-13-2019, 06:32 PM)John J Wrote: Took my console out to put in new carpet and misplace the fastener that hold the clock in place. Who sells them ? NPD has some that look similar but it said there for a 1970 mustang. John, are you talking about the "quick screw" nuts that go on the 4 plastic posts? Why would you take the clock out to fit carpet? Not sure what you're meaning. Can you elaborate? As for the one NPD show, I couldn't find them, but I may be able to find something that will work at my local 'fix-it' store on Monday. Actually, I need to find the same thing, so I'll go look anyways. Yes I should have given more info. I took the clock out to send it rocket man to have it fixed. Lost the nuts and can't seem to find them anywhere. 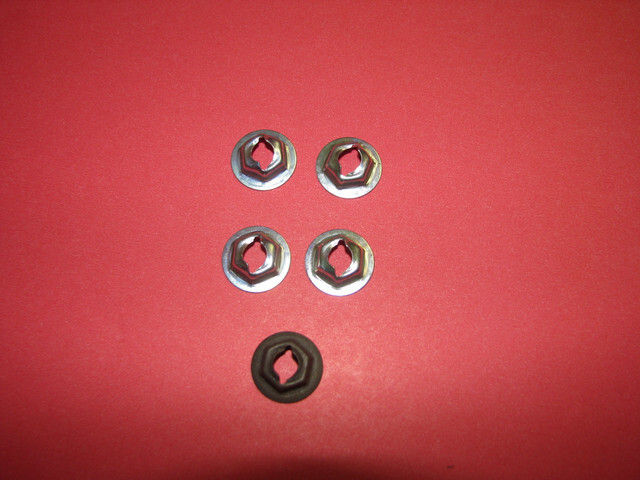 (04-13-2019, 07:03 PM)Stanglover Wrote: John, are you talking about the "quick screw" nuts that go on the 4 plastic posts? Why would you take the clock out to fit carpet? Not sure what you're meaning. Can you elaborate? Keep looking, but I'll check for you on Monday. I need some too. John, are these what you're looking for? If so PM me with your address and I'll send you 4. The bottom black one is the original. They are 1/4" quick nuts.